San Diego, CA – February 12, 2019 – Former San Diego Police Chief Shelley Zimmerman, a 35-year law enforcement veteran, has been named a Chancellor appointee serving in the capacity of a public safety and leadership consultant for the private, nonprofit National University. In her new role, Zimmerman will guest lecture on leadership topics, collaborate with faculty and law enforcement officials nationwide to inform public safety related curriculum, and contribute to teaching at National University, which has been recognized by U.S. News & World Report for having among the Top 20 Best Online Graduate Criminal Justice programs in the nation. Zimmerman, who received the San Diego Police Foundation Women in Blue Award for her commitment to making San Diego one of the safest large cities in the United States, has been recognized widely for her commitment to community outreach and proven technologies in support of public safety. Zimmerman’s appointment represents National University’s dedication to establishing deep partnerships with industry to identify accelerated degree pathways and develop market-ready employees to meet 21st-century workforce needs. 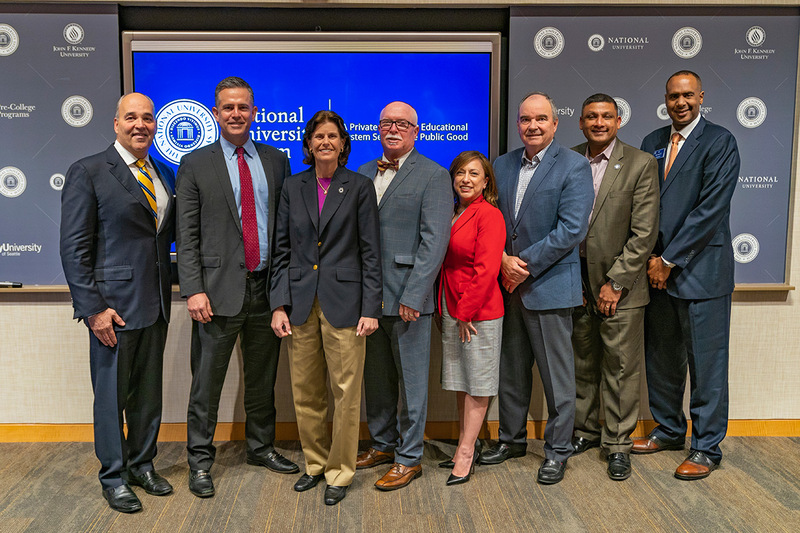 Former SDPD Chief Shelley Zimmerman announces she will join National University with NUS Chancellor Cunningham, NU President Andrews, and members of NU/S faculty and staff. Zimmerman, who holds a degree in criminal justice from The Ohio State University and is a graduate of the FBI National Academy, will help to expand National University’s unique offer to substantially reduce the length of time and cost for public safety professionals to earn a degree. The University’s credit alignment offer articulates prior learning experiences from state-approved training academies such as California Commission on Peace Officer Standards and Training (POST), to waive qualifying credit for degrees in criminal justice, public administration and homeland security & emergency management. In addition, the University also has made available 25 percent tuition scholarships to public safety employees and a 10 percent tuition reduction to their dependents to pursue a degree from the University’s more than 100 programs offered at campuses or online. Studies indicate that these kinds of initiatives benefit general public security and community safety through the ongoing professionalization and education of law enforcement officers in the latest approaches and skills relevant to their daily job. Also, having a college degree is valuable to retired officers seeking new career opportunities. During her tenure as Chief from 2014-2018, San Diego experienced historic low crime rates, including the lowest homicide rate per capita of any of the largest cities in the country, and attaining the lowest overall crime in five decades making San Diego the safest large city in America. Some of Zimmerman’s assignments included Vice, Narcotics, Internal Affairs, and Multi-Cultural Community Relations. She also assisted in the security planning for San Diego events such as the Super Bowl, Republican National Convention, Comic Con and MLB All-Star game. Zimmerman has received numerous awards and citations throughout her career which included: The San Diego Press Club Headliner of the year award for her undercover work, the San Diego Business Journal’s Woman Who Mean Business Exemplary Award for her civic involvement with both the business and residential communities, and the inaugural San Diego Police Foundation Women in Blue Award for her commitment to public safety. Veteran-founded National University offers a Bachelor of Science in Criminal Justice Administration and a Master of Criminal Justice. Notable alumni who have earned degrees through National University and have achieved prominent posts in law enforcement include former San Diego Police Chief and Mayor Jerry Sanders, Stockton Police Chief Eric Jones, Fresno County Sheriff Margaret Mims, and John Bolduc, Superintendent of the Nebraska State Patrol who was formerly Chief of the San Diego Harbor Police.